IS THERE A RATIONALE IN THE USE OF THE BONE STRUT ALLOGRAFT FOR MANAGEMENT AND INTERNAL FIXATION IN PERIPROSTHETIC HUMERAL FRACTURES? A CASE REPORT. You are at:Home»Embj»IS THERE A RATIONALE IN THE USE OF THE BONE STRUT ALLOGRAFT FOR MANAGEMENT AND INTERNAL FIXATION IN PERIPROSTHETIC HUMERAL FRACTURES? A CASE REPORT. The gradual increase in shoulder implants has resulted in a parallel increase in periprosthetic fractures of the humerus. Currently, there are no definite certainties about the best methods of treatment and there are no adequate devices to ensure optimal healing. Undoubtedly, the multitude of experience in treating femoral periprosthetic fractures can be a guide used to improve the approach to periprosthetic fractures of the humerus. The use of metallic fixation devices, in combination with bone grafts, could represent a favourable mixed mechanical and biological solution in the treatment of periprosthetic fractures of the humerus. 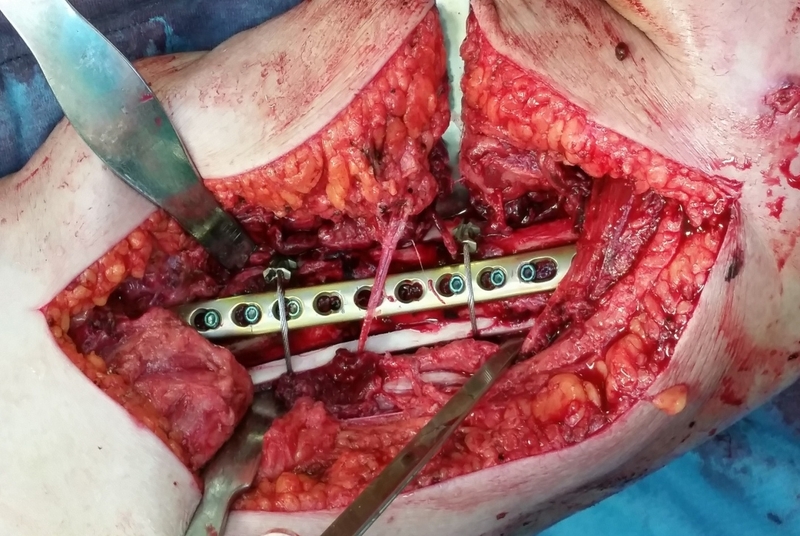 This article presents a case of periprosthetic humeral fracture in a 77-year-old woman with reverse shoulder prosthesis.